Intense, frightening, brutal, funny, sickening, and exciting, Martin McDonagh’s play The Pillowman opens March 18th at The Birdhouse Theatre in the West Bottoms. A writer in a totalitarian state is interrogated about the gruesome content of his short stories and their similarities to a number of child-murders that are happening in his town. Produced by fledging company She&Her Productions and directed by Trevor Belt, this unflinching examination of art, violence, and censorship stars Coleman Crenshaw, Matt Leonard, Jeremy Frazier, and Rick Williamson. At a time when much of the Middle East is poised on the cusp of revolution many states are at the edge of either unprecedented freedom or crushing repression. While we all hope for the former, this play is set firmly in the later. An English-speaking government, under the guise of moral authority and in order to protect its citizenry, has created a nation in which police have the ultimate power to imprison, torture, and kill with impunity. In this authoritarian state a writer is dragged into an interrogation room for writing brutally violent short stories, many of which feature graphic descriptions of child mutilations. He and his simple-minded brother are pulled into a maelstrom of physical and psychological torment beacuse someone has begun to act out his stories, brutally murdering children one by one. McDonagh at his best, this play is a tour de force of twists and turns, hope and hopelessness, and failure and triumph. It is great storytelling. Don’t miss it. 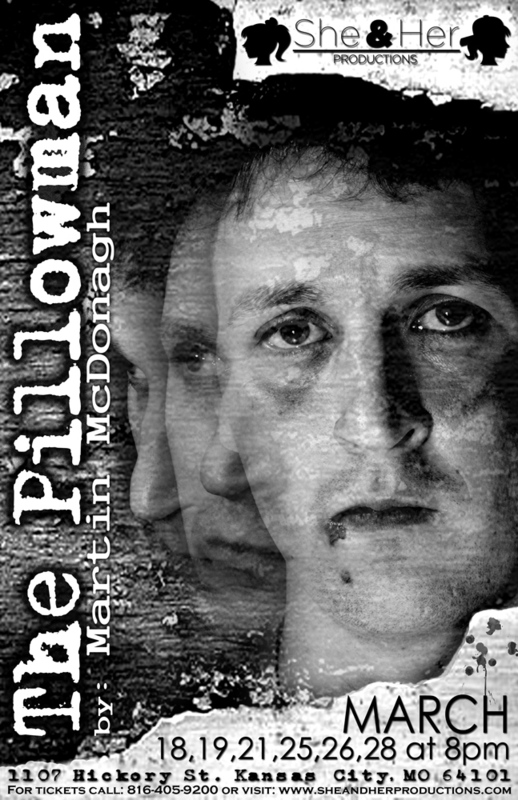 The Pillowman has a very limited run in one of the more intimate theatres in Kansas City, The Birdhouse Theatre in the West Bottoms, so seating is very limited. Reserve your tickets now at http://www.eventsbot.com/events/eb622581203. Or by calling 816-405-9200 or emailing the box office. March 18, 19, 21, 25, 26, and 28. All shows at 8pm. She & Her Productions is dedicated to the creation of quality and diverse performance art. Our goal is to entertain and educate in a unique and accepting environment which embraces and encourages diversity in our community, thus enriching the culture.